We've all sat through an abysmal training video. When you're trying to learn something new the last thing you want is a dull, confusing and downright insulting piece of training content that just makes you want to turn off. Luckily it doesn't have to be this way! Training videos don't need to be boring, and you really can use them to engage your colleagues, kick-start discussion and inspire real change in your business. Finding an emotional core is key to successful training. Modern research has found that emotions are a steer for thinking: they're necessary for us to engage in complex thought on a topic. That's why scenario-based training videos have become so popular — because they use dramatic scenes to resonate with viewers emotionally and encourage them to imagine how they would respond to situations in the real world. If you're trying to change attitudes and behaviours in your organisation, you need quality pieces of long-lasting training content that are crafted to get the right emotional response from your team. We've put this post together to give you a glimpse of what that content might look like. Here are 6 outstanding examples of training videos that connect with their audiences, encourage discussion and lead to meaningful change (and the principles they follow to do so). Connect your team, communicate messages that stick, and drive real organisational change. 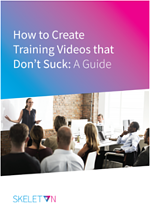 Read the guide packed full of all we've learned over six years of making training videos for clients like the NHS, Unilever and Experian. The point of a training video is to teach your audience something new in a way that will stay with them, whether that's a skill, method or concept. But focusing solely on the thing that needs to be learned — without also explaining why it needs to be learned — is a mistake. This short example from IBM is effective because it returns constantly to the problem at the root of the learning. It covers not just how to conduct a stand-up meeting, but also why doing so is such as good idea. The problem is at the forefront, and it's a very human one. Your teammates might be short on time. They might feel uncomfortable speaking in front of a group. Or they might need help working past obstacles. Almost every type of training is intended to fix a simple problem like this, whether it's removing an unnecessary piece of admin or making sure everyone goes home safely at the end of the day. If you remind colleagues that training is there to help solve their problems and make their lives easier, not just something that must be done because you say so, you have a strong emotional base from which to build effective content. Some subjects are just so big and so complex that it's a struggle to even know how to begin teaching your team about them. In cases like this, it's often wiser to bypass the complexity completely and use a strong metaphor to do the hard work for you. When Ernst & Young created this training video they knew their goal was to show colleagues why email can be less than secure. Would those colleagues also need to know all the ins-and-outs of email technicalities like SMTP, DPS and MTA? No. So the business instead created a fictional character to represent an email client. Rather than having to explain how the whole email system works to make their point, this personification allows them to work with a visual and emotional shorthand we all understand — a dodgy deliveryman who's more likely to open your package than deliver it. The result is a clever, succinct video that gets across exactly what the risk is and grounds it in terms the audience can connect with. After all, would you want somebody snooping through your mail? When we make a stupid decision, it's easy to imagine the worst. This training video from LRN plays on that common fear to teach an important lesson — by showing the worst-case scenario of a seemingly innocent office email. It's not only a funny video (more on using humour below), but it's also effective at explaining why certain behaviour and actions aren't acceptable, even when the likelihood of such an extreme situation coming to pass is fairly small. By taking a playful approach like this, LRN don't appear to be chiding their employees or driving a wedge between trainer and trainee. In fact all teammates can agree that such a ridiculous outcome should be avoided at all costs. This reductio ad absurdum might seem like an usual approach to training, but it succeeds at adding a fun and memorable edge to what could easily be a painfully serious issue. Today the most exciting training videos look more like big-budget blockbusters than the old, dusty VHSs of yesteryear. You can use the power of drama to communicate important messages with your audience in a highly engaging way. There's no reason why compliance training has to be boring. This 35-minute drama was created for a large organisation that had previously undergone a grueling lawsuit and wanted to make new employees really feel what such an experience was like. Just like any great movie, these kind of scenario-based training videos work best when they focus on the human drama and emotions involved in such a situation — rather than getting sucked up into an overly complicated plot. By allowing your colleagues to emotionally understand what an experience will feel like, you can engage their sense of self-interest rather than having to rely on boring policies or dry documentation. And that provides a far greater impetus for them to shift their behaviour. It can be hard to change your ways when you're told to do something out of the blue. But when you understand the resoning behind such a decision, and can make it logically for yourself, you're much more likely to stick to the new way of doing things. That's why the Rapid Learning Institute base their training videos on solid science and clear explanation. Once your team understand a subject, it's much easier to make them see why change is necessary — and why it will be beneficial for them too. In this example, a scientific explanation helps to reduce the guilt associated with certain actions and move the conversation forward onto how they can be altered. Of course, the video doesn't go into copious detail. It's not necessary. But it does provide enough of an educational framework to open up the possibility for growth, beyond any initial feelings of regret or disbelief. We know that, like emotion in general, humour opens up our minds and encourages us to think, connect and remember. It's a learning tool that must be used carefully, but one that can make any training video more powerful. Here the LDS Church take a totally unique approach to a lightning safety video by conducting an interview with a cloud. It's quirky enough to be utterly memorable, and the safety tips are weaved throughout with accompanying animations to make them stick in the viewer's mind. Because the humour here is kind and inoffensive, it works. It isn't inappropriate, so it helps to make the message feel fresh and keep the audience watching all the way to the end. You don't have to include a funny element in your training videos, but if it's smart and sparing it can go a long way to hooking your collagues immediately and throughout. When people laugh they pay attention, and when they pay attention they learn more. Those were 6 impressive examples of training videos that resonate emotionally with their audiences to bring about meaningful change, plus the principles you should follow when producing your own. Remember that emotion is the key to encouraging learning, growth and change in your colleagues and your organisation. Once you can engage hearts and minds, you have the foundation you need to make discussions happen, behaviours shift and your business become more productive, happy and healthy.